Soft pillows of marshmallow surrounded by a crisp outer crust, meringue not only delicious but also easy to make! 1. Place egg whites in a large bowl and whisk until soft peak stage. 2. Gradually add the sugar in small amounts, whisking until stiff peak stage. or place in a piping bag and pipe into discs or shapes. 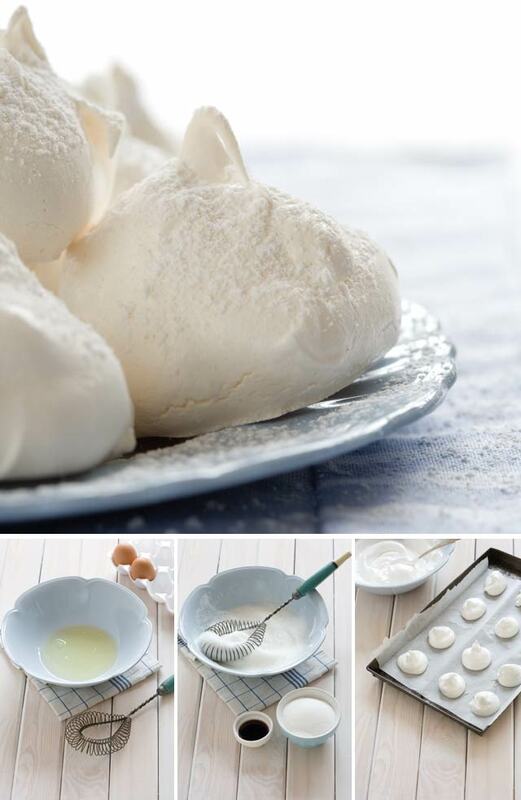 with a wooden spoon and let the meringues dry for at least 8 hours or overnight. * Make sure all utensils are spotlessly clean and free of grease. * No yolk should be in the whites – this will prevent the whites from whipping. * Soft peak stage is reached when a hooked shape forms on the whisk when it is removed from the meringue. * Stiff peak stage is when the egg whites are shiny, smooth and firm – the meringue will hold its shape when formed or piped. Why not try and make a delicious Mozart gateau meringue cake?